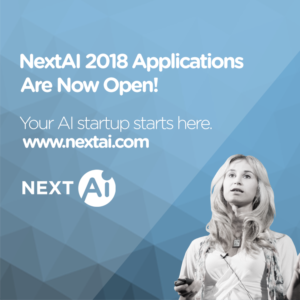 NextAI is a startup accelerator located in Toronto, Canada, accepting applications for its 2018 cohort. NextAI is for entrepreneurs, students, professionals and scientists looking to commercialize research and launch AI-enabled ventures. It is for existing teams with early-stage companies as well as individuals seeking co-founders with different skill sets to start something new. NextAI is the 3rd program from next NEXT Canada (joining Next 36 and Next Founders), a national nonprofit with a seven year track record of delivering founder development programs to a small group of exceptional entrepreneurs. Funding. Up to $200K per venture. 50K upon commencement of program in February 2018. Founder Development. In-depth business and technical courses taught by award-winning global faculty and subject matter experts. A curriculum focused on AI technologies and business foundation skills. Access to Leading AI Technologies and Tools. Unique access to platforms and people at tech giants including IBM, NVIDIA, Google, Amazon and more. Work with Top Research Scientists and Corporate Mentors. Insight into major corporate challenges and access to massive data sets and domain expertise. Office Space in an AI-focused Hub. Cutting edge workspace in downtown Toronto, surrounded by a critical mass of AI innovators, service providers and investors. Support for international applicants. NextAI (NEXT Canada) is a designated entity under the Start-up Visa Program.